No, Squint, you can't help. My picks: Arkansas Traveler was best, followed by Trucker's Favorite, Ponderosa Red, Rutgers, Creole, and Dinner Plate. The Homestead and Super Fantastic just didn't do it for me, and apparently not for anyone else either ~ those two weren't even mentioned except by a couple people to say they didn't like them much. No, you can't either, Nellie. The results from work were similar, but a different fave was picked: Creole. Maybe that's because it was sweeter and I like more acidic ones best? Maybe because the other night my taste buds were on overload by the time I got to that one? Maybe I'm just weird? Dunno (but my money's on the last one). BJ. Honey. I know you're not the brightest bulb on the string, but surely you already know what I'm about to say. I can see it in your eyes. You know, but you had to ask anyway so you didn't feel left out. Bless your heart. The Creole and Arkansas Traveler were the most talked about, and there were a few people who were adamant in their liking of one or the other. Since those two are also fairly productive (though no where near as much as Celebrity, dammit), looks like they're the front runners so far this year. 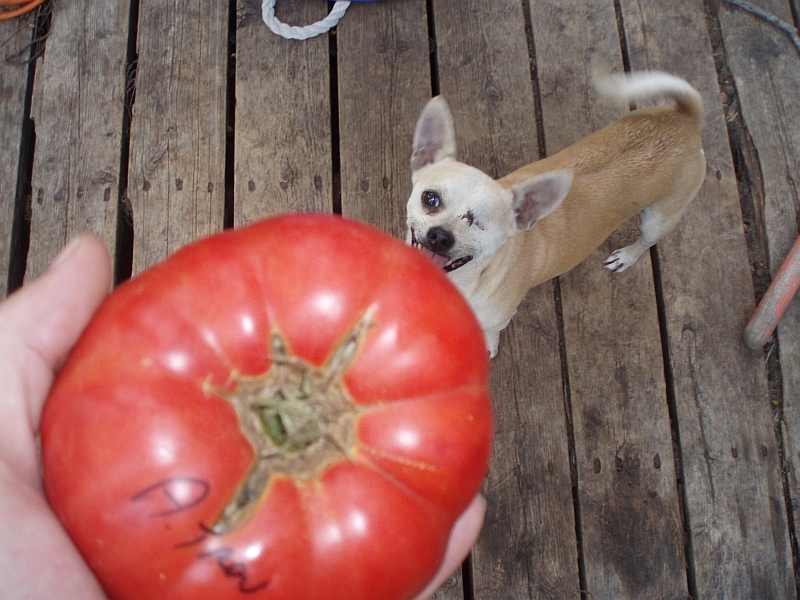 I think I'll enter one of each in the tomato contest at Ladybug this Saturday. I went out there to check and there are some nice ones still on the vines, but they're awful red. I hope they hang in there 'til then. The two fluted ones at bottom left are the Ponderosa Reds, and the two round reds front and center are the Creoles. And in case you didn't see the writing on the wa... uh, tomato, all the other pictures are of the Arkansas Traveler. And my goofy fambly who have to horn in on everything. God love 'em. 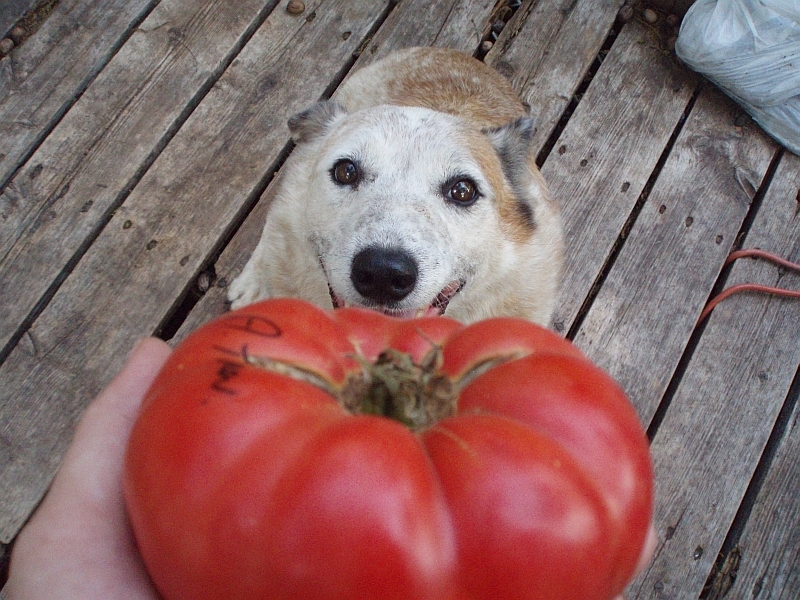 Your Arkansas Traveler 'maters look a lot different than mine. Mine are smaller, rounder and pinker, but I really like the flavor and they are very productive for me. I had the same thoughts about Homestead when I grew it. It produced copious amounts of tomatoes, but they were useless for fresh eating. I'm trying Porter this year as my "heat tolerant" tomato. It's been very productive so far, but it isn't the best tomato I've ever had. I'm hoping it will be a good freezer tomato to use in soups and chili over the winter. Thanks, Kari! Yeah, the Arkansas Travelers were a bit of a surprise this year. I was expecting not so big and not so red. 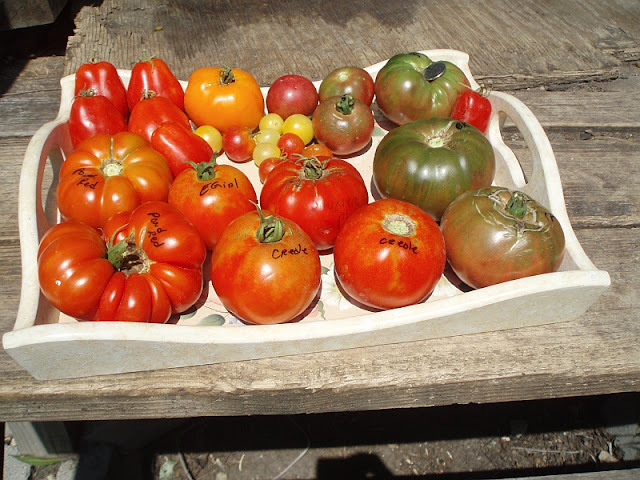 They are pinker than the others, a deep rosey purpley pink-ey red instead of a bright yellow red like the "usual" tomato. But still deeper, darker red than I thought they were. I never really had a good enough crop to notice in years passed, so was only going on what I'd read about online. I do plan to research the provenance of the seeds I started to make sure, and will be saving seeds from this plant as well. 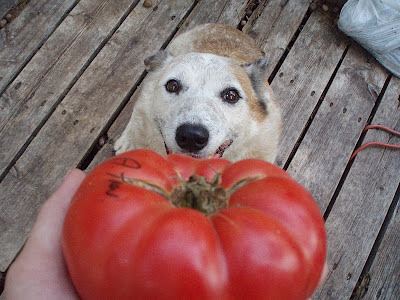 I won tastiest tomato in the contest today! WOOT! I'm just about to make a post about it. I'm not sure if it was the Traveler or one of the others I entered (Creole, Ponderosa Red, Snow White, Valencia Orange, or Brandywine). I had to work today, so my boss offered to take my entries over there for me. I'm SO glad he did! Hey, how are the root knot nematodes this year? Better since the Actinovate? Congrats on your tomato victory! :D I'm looking forward to hearing which one won so I can experiment with it next year! The Actinovate seemed to help with the nematodes, although it didn't eliminate them entirely. The tomatoes did well, but the okra and green beans weren't very productive. Of course, it was only a few degrees short of boiling all summer, so that could have been a factor as well. (I wasn't all that productive, either...) So far, so good this year. I put in raised beds with lots of organic matter and sprayed with Actinovate again and everything looks great. Take that, microscopic pests! p.s. I tried the Black Giant you raved about last year. 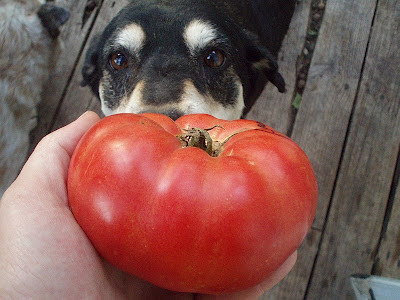 W-o-w that is a good tomato! I'll definitely be growing it from now on. So the Actinovate seems to be working well? Great! That'll be good news to our customers who have them in their gardens. Thanks for the congrats! The winner of the contest was either Creole or Arkansas Traveler. My boss was entering them for me since I had to work, so I told him if registration was a pita, just enter the Traveler and Creole. Aaaaaaand registration was a pita. But I'm kind of glad because I won with only two entries, instead of six. Better bragging rights! Yeah, that Black Giant is nommy! Another one you should try is Valencia Orange. Sweet with just enough hint of tang to make it interesting, and very few seeds. And it's just gorgeous. I've got pictures and raves elsewhere in other recent posts. Oh, and Snow White. Fruity sweet little very-light-yellow cherry type. NOMNOMNOMNOM. Thank goodness it's incredibly productive or none of them would ever make it in the house. Eventually I'll do an end-of-year wrapup with more info about all the best ones. How vigorous is the Valencia Orange plant? I've been growing Orange Oxheart for the last few years and I really like the tomato, but it is the wussiest, most disease-prone tomato plant I have ever grown. I would be happy to have a healthier tomato to take its place. Best I can remember from where I sit (inside sucking up the A/C after spending all day in ONE HUNDRED DEGREE HEAT. Already. Dammitdammitdammit. ), it's fairly vigorous despite the fusarium running rampant through the tomato patch this year thanks in no small part to The Winter That Never Was. I'll double check that and get back to you if I'm remembering wrong.